Welcome to the start of this blog series on MVVM. I won’t make Douglas Adams’s mistake of announcing in advance how many parts there will be – I’ll just keep going as I see fit, and hopefully you’ll stick around. 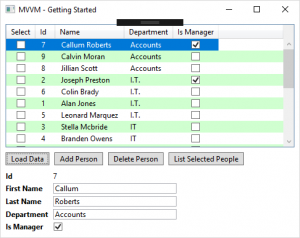 Over the course of this series, I’ll be creating a demo application, StaffManager, a utility for organising the employees & departments at a small company. All of the code samples for the posts are available on Github, along with my own personal C# / WPF library. The code is written in Visual Studio 2015, for .Net framework version 4.6.2 has been updated to Visual Studio 2017, and .net framework 4.7.2. The demo applications are provided purely as proof of concept (spike applications) – there’s no unit testing or other features you might expect to find in a full production project. So here’s the first version of the application. The code is pretty similar in style to what I’ve seen presented in other introductory articles. It compiles, it functions – so long as you click the buttons in the right order, and other than the one MessageBox() call, it’s MVVM pure. It doesn’t even have any dependencies on third party libraries. A simple poco class, that implements INotifyPropetyChanged, with properties for Id, FirstName, LastName, Department, IsManager, and IsSelected, plus a calculated DisplayName. Person implements IComparable to enable sorting. Another plain C# class, again implementing INotifyPropertyChanged, that populates and maintains a list of people models, and implement the three commands for managing them. A standard WPF window, with a DataGrid to display the list of people, a set of controls to allow editing of the selected person, and buttons to call the ViewModel commands. The only extra class is a very basic ICommand implementation. So, although the application runs, the project structure and design do leave a lot to be desired. Over the next few posts I’ll be refactoring it into my particular style, creating a cleaner code-base and adding to the application functionality. In my next post, I’ll begin the clean up by looking at the Model layer. Don’t forget that all of the code samples for this blog are available on Github, along with my own personal C# / WPF library. If you find this article useful, or you have any other feedback, please leave a comment below. What license is your code published under? Can I use your framework as a basis for my application(s)? The code is released under the MIT licence. Feel free to use it in any way, including commercial applications, so long as the licence and copyright notice is included. I feel like an idiot, it shows the MIT license right on GitHub. The first has to do with TreeView. Any thoughts on drag and drop with your code? I like your attention to separation of concerns for MVVM, but the proof of it’s reusing the viewmodels with a different UI. Had you thought about a UWP or Xamarin demo? I’ve focused on WPF in this blog, purely because that’s still how I’m earning my living, and therefore most comfortable. The post relating to Model and ViewModel could be directly applied to UWP and Xamarin applications, and although those relating to UI elements might take a little tweaking they should still offer a good base for those platforms too. I’ll be writing a post on generic drag and drop for MVVM shortly, I’ll try to include an example of how to apply that to TreeView controls. Copyright © 2019 Peregrine's View. All rights reserved.